The second type of cupola that was used on Tigers (with 7 periscopes) could mount an MG for defence against aircraft. There was a metal ring on the cupola, and a bracket that could slide around it. An MG could be placed on the end of the bracket. Both the MG and the bracket were removable and were usually not mounted. Rather than carry an MG specifically for air defence, the crews tended to use the spare MG from inside the tank. It was of the type MG34, the standard machine-gun for German tanks. The MG42, which was invented later, was superior but could not be used in tank ports. It is not likely that a tank would carry an MG42 as well as its MG34s because there would be extra boxes of tools and accessories to carry also. Rye Field introduced the MG and bracket when they released their first Mid Tiger (#5008). 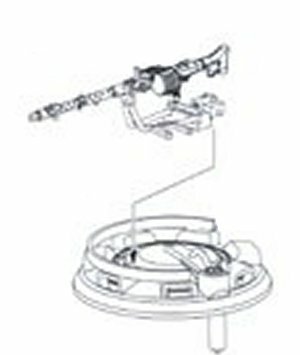 This is an extract from their instructions showing the attachment of the gun and bracket to the cupola. In fact the bracket can be placed anywhere on the cupola ring. In their later kits they suggest attaching the legs that would support this gun on the ground. But, because the MG was usually the spare from inside the tank, it's very unlikely that the legs would be attached to it. They were stored in a box. There is a problem with the barrel (part O5). 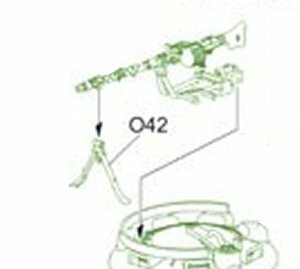 The MG34 used in tanks had a special barrel without air holes, because it was slotted into the tank's armour. Rye Field have provided the standard infantry version of the gun, with holes all along the barrel.